Hi! What kind of insecticide granules did you use? Thanks! We have the same problem here in Mobile, AL. I am also very interested in the kind of granules you used. muttmom - as I said, I've been using the borax/sugar solution for more than 4 years now. It used to work very well before the weather changed, treat them once or twice a summer & no problem. Now, I re-apply when the eggs hatch out 2 weeks later. This might get rid of them for a month or two....but they keep coming back. They come in through the foundation of the house. The only way to get rid of them then is to keep them from coming inside in the 1st place. I don't like to use poisons either when I can help it, I'm an outspoken advocate on these forums for borax to treat ants & fleas. But in this case, I was tired of dealing with this every few weeks during the warm season. When they swarm your kitchen, crawl on you while you stand there long enough to cook or wash dishes & you have them crawl on you while you sit on the couch - it's time for poison! We didn't have such a severe problem a few years ago, when it wasn't so dry & the winter was cold enough to freeze them. The last few years are so dry, they are going into homes for water & the winters are so mild it doesn't kill them either. This last summer was an absolute nightmare of ants. We finally had to call in a professional exterminator. That didn't last either. After that I used Terro. What I was told by the professional is that they are not true "sugar" ants, as they normally come in for water and warmth. This explained why once they were only in the bathroom and not the kitchen. 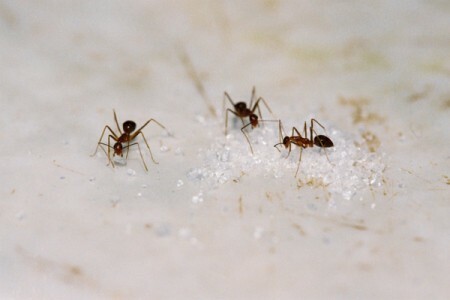 They resemble sugar ants as they are very tiny. I was always brushing one off me, and I had nightmares about them. I just read in today's paper that these ants are called Caribbean crazy ants or hairy crazy ants. They've been around at least since the 1800's. They are very small and when one is killed, it gives off a chemical that attracts many others. So killing them can create a huge problem. The article said that Borax, etc. will not keep these ants away, that even many professionals can't get rid of them for long. Only one professional that they interviewed was able to get rid of them for any length of time with very strong chemicals. It's great to be earth-friendly, but if ants like this were crawling into my house, I think I'd talk to a professional. Search crazy hairy ants and you'll see that some of them are coming into Texas on hay bales brought in to feed the cattle because of the drought. I hope you find a good solution down south because otherwise they'll be spreading everywhere. Good luck. I loved that you kept your sense of humor. Your comment "Shake my can" cracked me up. Thank you, I needed that. It would sure be nice to have the name of the granules you used. I live in Arkansas, and we have had this problem for the last decade. I too used the borax-sugar solution for about 5 years, but it will only get you so far with these ants. I even went through the yard pouring it on every ant hill I saw. The problem was the neighbors, who did nothing in their yards; their ant hills proliferated, and the ants spread into our yard, giving us another population to treat. I've recently started using food-grade diatomaceous earth. I buy a 50 lb sack at the feed supply store for about $40.00. it's harmless to children and pets - you can eat it. Some sites say to not breathe it in, but they are referring to the non-food grade, which is treated differently and is a poison. I sprinkle it in my home, around the house foundation, around the yard, and on ant hills. Rain carries it in the soil, where it still kills the ants. By the way, it kills roaches too, yet will not harm worms. I reapply it every year, since we are over-run in our neighborhood with these ants. It's like a plague.